Marilyn’s knowledge, experience and supportive manner helped participants to develop themselves, and their viewpoint during the training session. Her style and approach allowed information and good practice to be shared in a positive environment fully involving all participants, and by the end of the session they were motivated and keen to put their learning into action. Support staff make up around half the workforce in schools and make a positive contribution to pupil development and the successful running of a school. 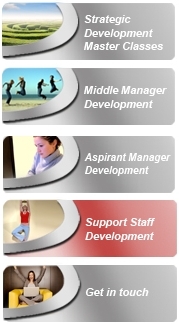 Support Works is a unique approach to engaging support staff in school learning and development. Initiate the first step on the leadership and management pathway - self-awareness, self-knowledge, self-leadership. Half day workshops to include a taught programme, workshops, visits, shadowing, subject matter experts, simulations and access and signposting to web learning and materials. Participants will gain personal and professional skills, knowledge and confidence. Participants will support the development of a positive work place climate through example. Participants will become knowledge agents to help spread the messages of work force development and future trends of education. The school CPD co-ordinator will have the support of a team to help develop and drive initiatives and build capacity in others. This course can be adapted to suit individual school requirements.